Many books have been published to mark the centennial of the start of World War I. Some narrate the history of the entire conflict; others study this or that aspect of it in depth. Jenkins’s book belongs to the latter category. 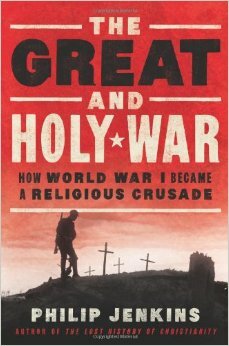 It focuses on how European combatants framed the conflict using the holy war rhetoric of medieval Christendom. Nations used this rhetoric whether or not they had an established state church. Soldiers were viewed as martyrs. They claimed angelic and miraculous interventions on the battlefield. Among the heterodox, paranormal, occult experiences were common. Even radical social movements such as Soviet Communism, though they were avowedly godless, expressed their aspirations in apocalyptic and millenarian terms. After surveying the religious dimension of the rhetoric and experience of the combatants, Jenkins then shows some of the global consequences that arose in the aftermath of war. The Great War was truly a world war in that the empires fought over their colonies and enlisted their colonized subjects to fight on European soil. As they enlisted this or that colonized group to fight for them, they unleashed forces such as Zionism, anticolonialism, Armenian genocide, African indigenous churches, and politicized Islam—forces that had sometimes explicit, sometimes implicit religious dimensions. These forces continue to influence world events today. Consider the Israel-Gaza conflict. The British Mandate in Palestine came about because of the Entente Powers defeat of the Ottoman Empire, which until then had held sway in that region. The United Kingdom had promised Zionists that it would work to establish a national Jewish homeland in Palestine in 1917. But it also made promises to Arabs, and established Hashemite kingdoms in Transjordan and Iraq after the war. Facing Western dominance in their ancestral homelands, Arabs developed two contrary responses: a secularized Arab pan-nationalism and a politicized Islam. Secularism was the choice of many Arab Christians and other minorities, who longed for Arab statehood but did not want Muslim dominance. Politicized Islam, on the other hand, longed to reestablish the caliphate, the Muslim umma (peoplehood, empire), and sharia as the law of the land. In Palestine, the Palestinian Liberation Organization and Hamas represent these contrary responses. Even granting, as Jenkins does, that the Entente Powers had more justice in their cause than the Central Powers had in theirs, the contrary rhetoric of the Christians on both sides of this conflict call into question whether God was truly on either side or whether each was simply using him to justify their nation’s actions. No wonder, in the aftermath of the war, Christendom died in Europe and secularism began to take its place. It had been killed by Christians. For revealing the religious contours of a European (and American) religious world order now gone; for demonstrating that Christians—not just Muslims—have a history of politicizing their religion for violent purposes, even in recent times; and for showing how the religious world we inhabit is one birthed in the fires of the Great War, I highly recommend Philip Jenkins’s The Great and Holy War.